Morvern lies in the western side of Scotland in the Highlands. It is a peninsular just north of the Isle of Mull, surrounded by water apart from a five mile connection with the mainland allowing the main road to reach Scotland without a bridge or ferry. It should not be confused with Morven in Caithness which is the name given to a conical shaped mountain. 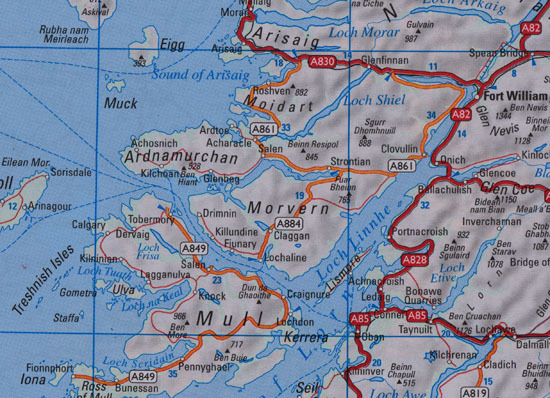 Similarly there is a Morven in Aberdeenshire. The sequencing pictures above are: 1. Port welcome sign, 2. Parish Church of Morvern at kiel, 3. Lochaline filling station, 4. The medical practice building, 5. Morvern Crescent, one of a small number of roads, 6. The Wishing Rock, climb through and make a wish, 7. In discussion with the new distillery management at drimnin, 8. Ardtornish a Morvern stately home. Morvern in the Highland is a parish in its own right. The name is derived from the Gaelic, A'Mhorbhairn meaning 'the sea gap'. It occupies an inverted pyramid shaped peninsular of land approximately 250 square miles in size. The highest point is the summit of 'Creach Bheinn' at 2800 feet. To the north Loch Sunart, to the south-east Loch Linnhe and the Sound of Mull isolate Morvern. The principal settlement is Lochaline to the south, from where the ferry can be taken across the Sound of Mull in the south-west, to the Isle of Mull. A single road across the peninsular, the A884, connects the port to the mainland. 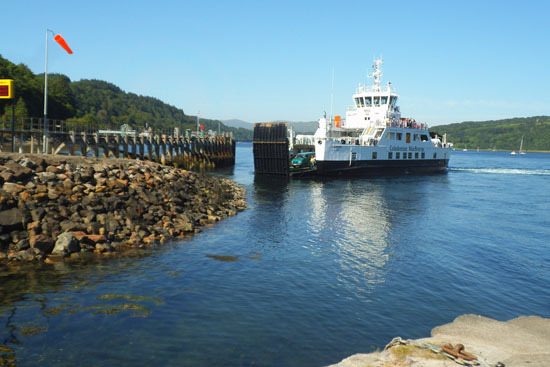 For those heading south however the car ferry at Corran/Clovullin provides a shortcut rather than heading north up to Fort William or taking the two car ferry route via Mull to Oban. Historically boats were the preferred transport when the population was much larger. Most of the landscape of Morvern is typically glaciated mountains and valleys dotted with conifer plantations. The population is only about 300 persons, supplemented in summer with tourists, particularly from Holland and Germany. Fort William is the largest town to the north, lying some 20 miles to the north-east of Morvern. 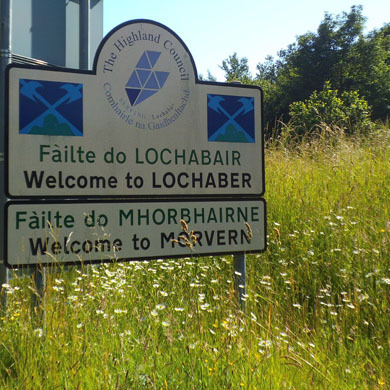 The largest settlement in Morvern is Lochaline which has a shop, church, medical centre, school and post office. Most of the population live in Lochaline. Earlier the population had been five times the present day size but a series of misfortunes reduced it substantially. After the Battle of Culloden in 1746, Government troops came to Morvern searching out the enemy during the Jacobite Rebellion. Boats and buildings were destroyed and the landscape burnt. In the south Morvern was described as a red cinder that stayed alight for months. Further depredation followed with the Highland Clearances when tenant farmers were evicted in favour of large scale sheep farming. In the 1840s the Potato Famine struck causing half the population to emigrate using ships from Lochaline port. Above - the car ferry arrives at Lochaline from Mull.